My crochet, reading, and other cultural outlets. I was excited to find this available to me on BookMooch, as I remembered it fondly from my own childhood, and it didn’t disappoint when reading it to DD. While the pictures and incidents came back to me as I read it, I had forgotten how relatively long this story is; DD seemed quiet and attentive for the whole thing however, which I was impressed with. 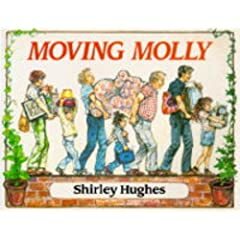 While the core of the story is Molly and her family moving from one home to another, there is far more to this than a simple, “Molly and her family were moving house. A van came to move their furniture. See their new house and garden.” Instead we have a much more nuanced tale of a roughly-four-years-old child’s perspective on the old home and what it was like there, what the actual moving day (and the ones before and after it) entails, and her finding a place and activities for herself in the new one. While this might well be useful in getting a child used to some of the issues involved in moving house, it’s well worth the read even if you never do (and my mother still lives in the house we had when I was born). This entry was posted on Monday, 18 April 2011 at 1:17 pm and is filed under baby stuff, books. You can follow any responses to this entry through the RSS 2.0 feed. You can leave a response, or trackback from your own site. Sounds delightful. Thanks for the review. I’m going to have to check out the Shirley Hughes range of books.